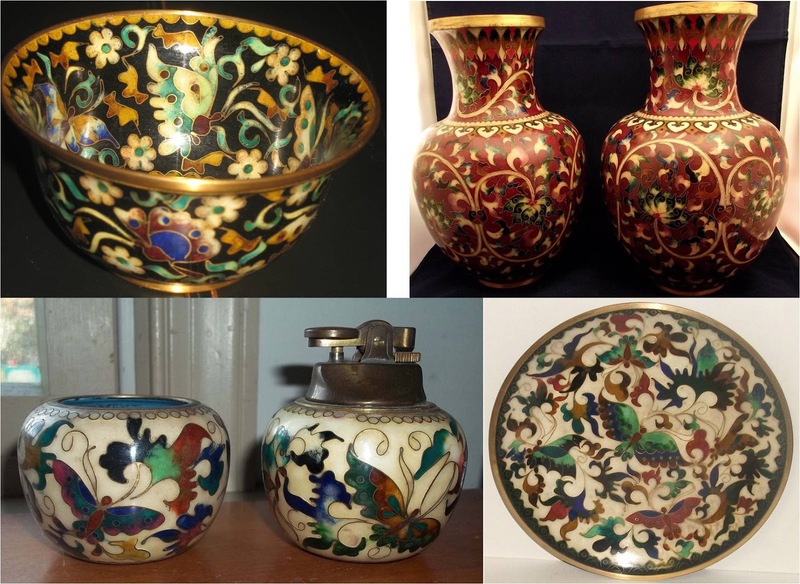 Two renowned cloisonné artists from Taiwan are Kuo Ming-chiao (1917-2014) and his son, Robert Kuo. Kuo Ming-chiao has dedicated himself to the creation of cloisonne art for 30 years. He began his artistic career, however, as a painter, and his works were internationally exhibited and acclaimed as masterpieces of Chinese painting. He received many awards, including those presented in Vietnam, Australia and the United States. 1960, he had what he described as an "electrifying experience." In a marketplace near Cologne, West Germany, he was overwhelmed by the splendor of the cloisonne art on display. He abandoned his plans to continue his continental tour, choosing instead to remain in the small German town to learn the art of cloisonne. Robert Kuo’s online biography tells how he spent over a decade, from his teenage years to his late 20s, working in his father’s atelier to learn the process of cloisonné manufacture. What puzzles me is how this was all accomplished. Certainly there had to be other artisans in the factory besides Kuo senior and son – people to manufacture the brass shapes, produce the cloison wire, apply the designs, manage the sourcing and stocking of the enamels and polishing grits, supervise the kiln, manage work flow and ensure proper work station furnishing, machines, and tools, etc. etc. 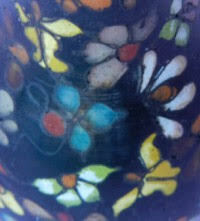 Cloisonne is a very labor-intensive process requiring practice and skill. 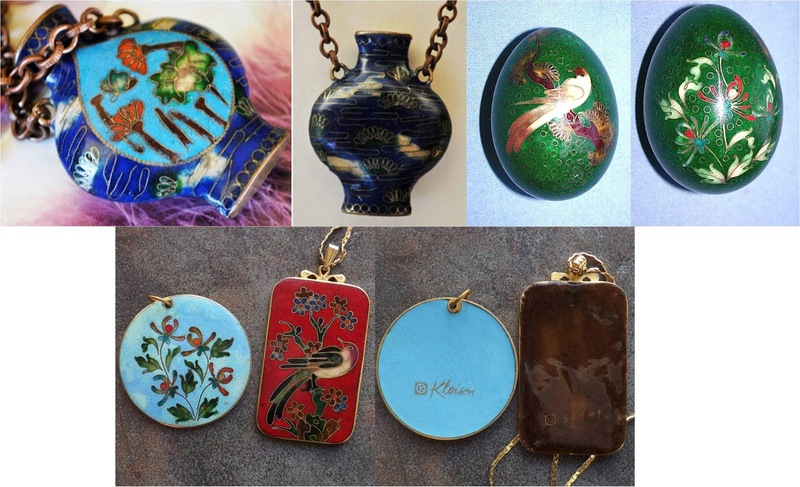 If one developed a sudden interest in cloisonné manufacture, surely the most effective way to start production would be to either take over the management of an existing atelier, or at least commission special work by them? Why reinvent the wheel? Were the resulting designs a coordinated effort between traditional artisans and Kuo artistic innovation? Note the date Oct 1, 1949. 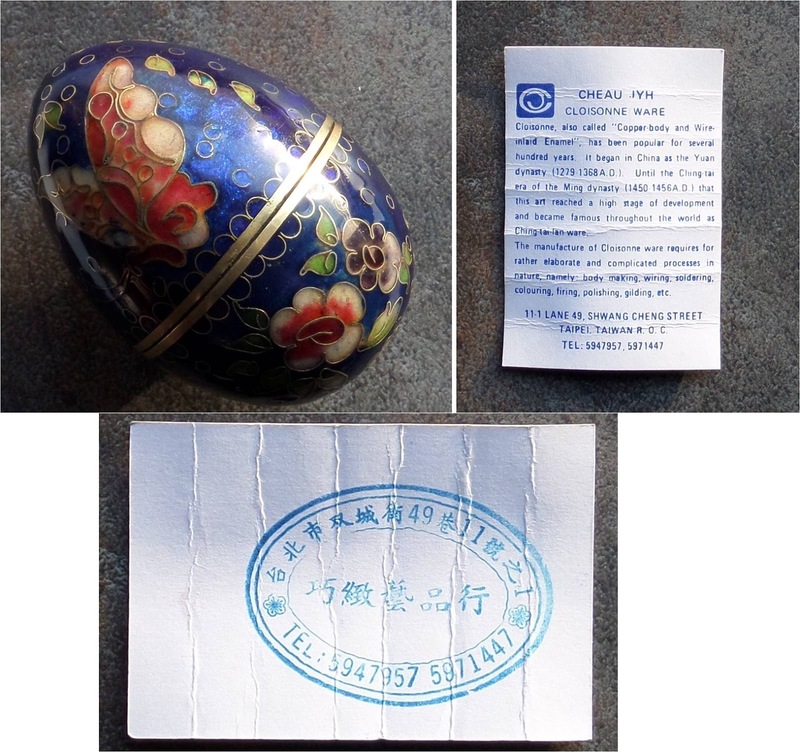 On eBay I found this little cloisonné egg box, with its original label intact. Unfortunately I am illiterate in Chinese, but the numbers “49 11 1” made me wonder if they represent the date of November 1, 1949, and if there was any connection between the migration of Nationalists to Taiwan and the founding of the cloisonné factory that produced this egg (instead of, say, commemorative of a birthday or holiday or something). 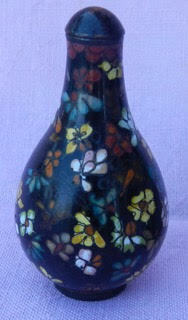 The style of cloisonné – transparent cobalt enamel, mixed rose and transparent enamels in the flowers and butterflies, small circles as background fill – is not at all like mainland work. 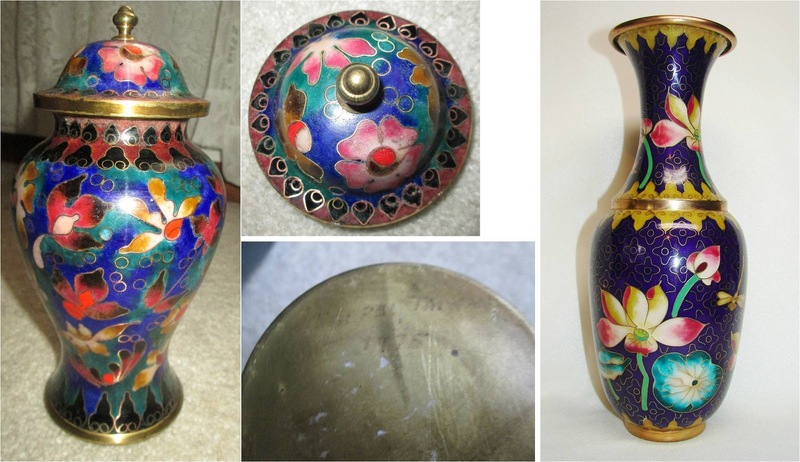 Is this an actual Kuo design, a Kuo-style copy, or an example of a general Taiwanese cloisonné style that developed after 1949 by artisans fleeing the mainland? At least one cloisonné artisan liked to use a semicircle of wire loops to represent vegetation or foliage – you can trace this motif from the small bottle pendant through this Kuo cloisonné egg. Overall, these designs depart from decades-long stereotypes produced by other Chinese workshops, as if the artist were following his/her own vision to represent traditional Chinese themes. Ruyi motif on pre-WWII vase, on JingFa vase post-1956, and Yun Kang vase from Taiwan. Note the completely different neck and collar wire motifs in the Taiwan vase. Note the granite-like counter enamel on the base, and the splashy enamel application that is also seen in Taiwan cloisonne link bracelets. Then there is the mysterious Yun Kang factory. 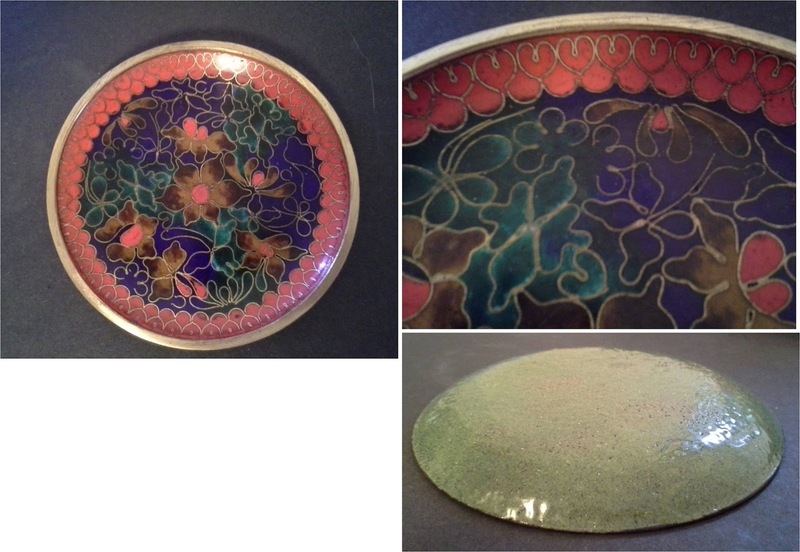 Pieces display all the characteristics of Kuo cloisonné, with a distinctive granite-like counter enamel (counter enamel is applied to the reverse sides of the metal form to provide equal tension against the decorative surface enamels, so that the metal is not warped as the glassy enamel contracts during melting and cooling). Is this a predecessor to the Kuo label? 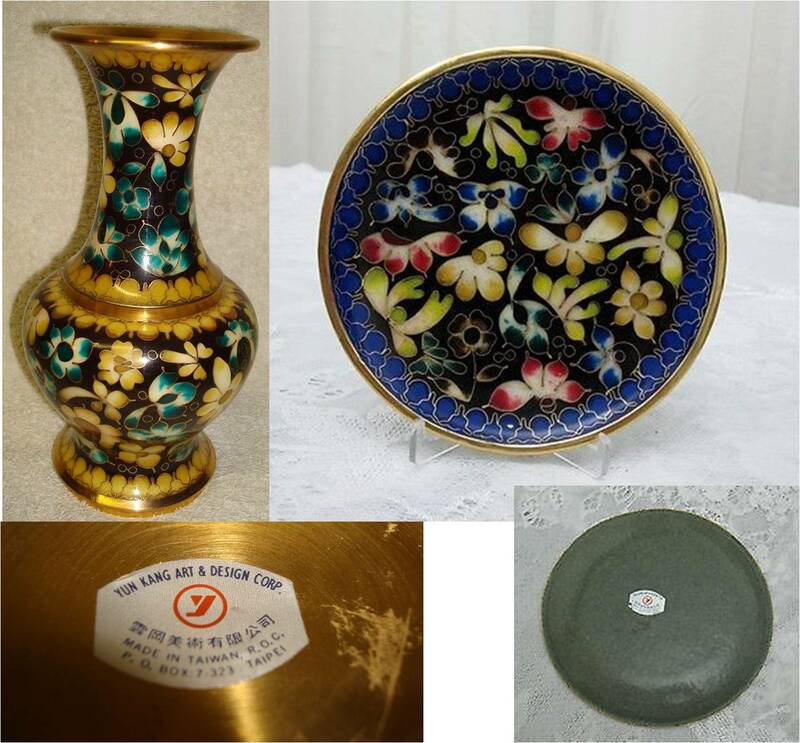 Evidence such as this Mementos and Artifacts blog account dates the small Kuo-style vases and condiment sets to the late 1970s. Jar inscription on base reads "Taipei Taiwan 1975." Note similarity of Ruyi-style collar motifs in Jar and vase. Vase on left courtesy of eBay vendor gottoget123. These vases all have a Kuo logo on the base. The viewer will no doubt have already noticed their similarity to the Yun Kang vase pictured above. The various Kuo trademarks appear throughout the 1970s and 1980s. Later cloisonné pieces by Robert Kuo became more abstract, larger, and architecturally imposing - pieces of sculpture rather than decorative bric-a-brac. Since starting work in his teens at this factory, which his father established in 1960, Hsu—who is now in his 70s—has seen the rise and fall of the local industry. He recalls that in the 1970s and 1980s, business was so good that the factory was backordered for a year. But like most other labor-intensive industries in Taiwan, glassware manufacturing lost its competitive edge as land and labor costs increased. “Factories either moved elsewhere or closed down,” Hsu says, recalling that there were still about 3,000 craftsmen working in 50 glass factories in the Zhunan area 10 years ago, but that the numbers have declined to around 100 workers and a handful of factories now. In fact, Kuo Tai has also cut the number of its employees from 60 to 15 and once considered moving to mainland China. Finally, what to make of items like these? Are they the last gasp, so to speak, produced in the final days of a factory staffed by artisans on the verge of retirement and with production declining and outsourced elsewhere? 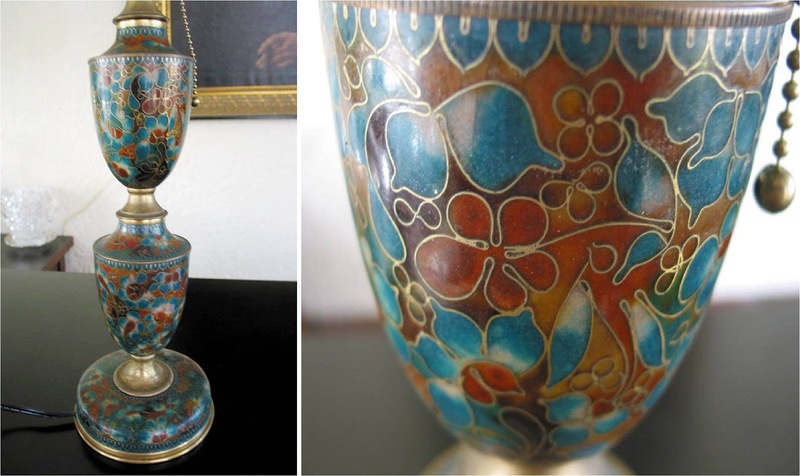 Small cloisonne egg jars with enamels and motifs similar to Taiwan cloisonne items. eBay seller relates purchasing them in Shanghai in the 1960s, was permitted to be in China at that time because not of U.S. nationality. Yun Kang or Kuo style small plate. Notice style of enamels and counter enamels, heart-like motifs at the rim. Another Yun Kang or Kuo style plate. Unusual 13" lamp that appears to be composed of two small vases soldered atop one another. Note the similarity in enamel and motifs to the plates above. Courtesy of eBay vendor chris638brad. UPDATE: A 1985 Arts of Asia magazine article on Kuo Ming-chiao answers many of my questions above. 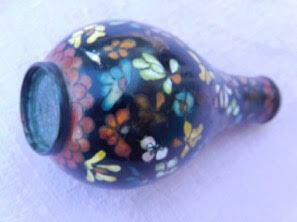 UPDATE: A correspondent has sent some pictures of a snuff bottle that may have design features characteristic of Taiwan cloisonne - or is it a product from mainland China? When? (Obviously before 1981, because that's the year the owner purchased them in New York). The yellow trefoil flower resembles a motif seen on beads by The Dot Artist. I've also provided some pictures of cloisonne eggs that the purchaser (not a US resident) stated he purchased in Shanghai sometime in the 1960s. I've often wondered about these eggs, as they seem to be very Taiwanese. Opinions? I bought a pair snuff bottles in New York in 1981. I wonder if they belong to the same "Kuo-type" group. Is there a possibility to post fotos on your blog? Sure. If it doesn't work in comments, we'll go to Plan B in order to get your pictures posted. Thanks, Georges. Updated the post to show your pictures, also some more detailed photos of those Shanghai eggs from the 1960s.